What is UVB light therapy? It is light based treatment, where the skin is exposed to light with a wavelength between 320nm and 400nm. 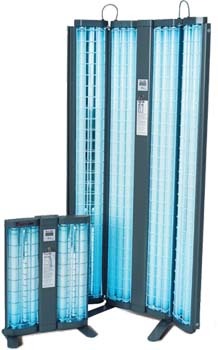 There are 2 forms of UVB light therapy. Broadband Ultraviolet B phototherapy and Narrowband Ultraviolet B phototherapy. We use Narrowband Ultraviolet B Phototherapy (NB-UVB), because it has been shown to be the most beneficial component of natural sunlight for the treatment of psoriasis. Will UVB light therapy not cause skin cancer? UVB light therapy will not increase your chances of developing skin cancer as long as the total number of treatments stays below 250. To induce remission in psoriasis using Narrowband Ultraviolet B phototherapy you will need between 20 and 30 treatments. Which skin conditions can be treated with UVB light therapy? Patients attend two to five times weekly. Patients will undress completely, except for their underwear and protective goggles. The ultraviolet lights are then switched on and the skin exposed to the ultraviolet light for a few seconds to minutes. What side effects are there with UVB light therapy? The same side-effects you can get when exposing yourself to sunlight, i.e. burning and blistering. These are however rare and is not necessary for the treatment to work. How long does it take to start working when treating psoriasis? Patches of psoriasis generally start to improve after about ten treatments. Most patients with psoriasis require 20 to 30 treatments to clear. How long will I be free of psoriasis after finishing a treatment course? Dear Jason. If the diagnosis is correct then NB-UVB has been used as a treatment. I have been diagnosed with psoriasis and it’s all over , I read your article about the procedure. When I mention I have it all over I’m talking about my private areas as well , I want to do the light therapy and want to know if it would cover that as well ? Also does it leave after marks ? All affected areas can be treated. Treatment itself does not leave marks. I have eczema from childhood. I have used various topical corticosteroids. Will the uvb help clear the eczema and reduce the marks? Hi Leanne. It depends on the type of eczema. If it is Atopic eczema, then yes, UVB can help. Regarding the marks….it depends on the type of mark. We can look at that if I see you. Dear M. Who made the diagnosis? Was she born with white patches? hi Doctor. I took her to a dermatologist whom diagnosed her. she was not born with it. The white patch started at 10 months. and has doubled in size in 6 months. Hi M. Would be best to take her to a dermatologist that can manage the treatment, but I would start with mild topical anti-inflammatory cream. Hi Imraan. Not as a first line treatment. Protopic will be a safer initial treatment option in a child.